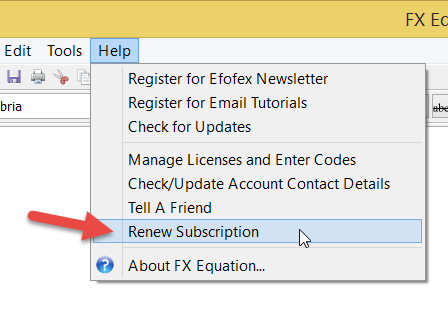 Another change we are making to address schools “losing” Efofex is that any product that is currently licensed through a subscription will offer the opportunity to renew directly from the software. Choose the Renew Subscription option from the Help menu (as you approach and pass expiry, the software will offer you other opportunities as well) and you will be directed to the renewal page on our website – with all of your details pre-filled. This will be a far more effective system than our current email based system.